NOTE: 9/13/12 – I had to run the above 3 or 4 times before it actually let me perform the install. So be patient. That’s all I had to do to get this to work. Should be under Microsoft SQL Server 2008 in your start menu. 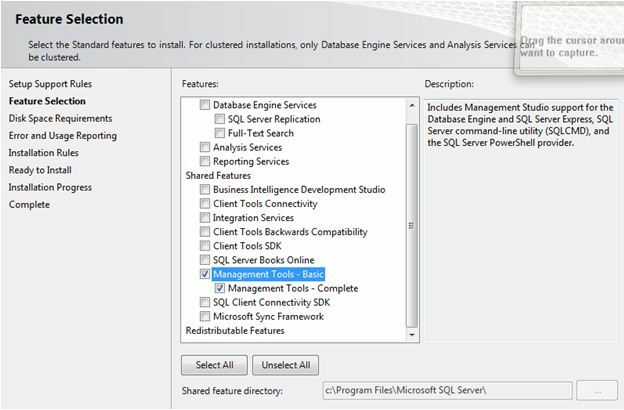 You might also want to install the Business Intelligence Development studio, but that’s up to you. I was building a website using Visual Studio 2008 and everything would build fine. It also published with no problems, however I kept on getting errors when visiting some of the pages. I ended up finding the answer on an old message post that saved me a lot of headaches. The guy who posted it didn’t write English very well, so I’ll give a more detailed example and explain how the fix worked for me. If you look at the code above in the aspx file, I still had inherits= pointing to the original termscodelookup.aspx page that i had created instead of the TermsCodeLookupNew.aspx page. And in the codebehind .vb file the partial class was named after the old termscodelookup page instead of termscodelookupnew. UPDATE: Another area where this can occur is when you get this error and everything looks correct in your pages and the inherits matches the codebehind class. The reason this may not work is that the class name may reside in another webpage that you may have copied, and forgot about or never used to begin with. Just do a solution-wide search in visual studio of the class name of the page that you are getting the error on. Chances are it will find it in some long-forgotten page, or maybe a copy you made of a page in which you wanted to keep the original just in case.